Mercure Atenea Aventura **** Aparthotel is located in Vila-seca, Costa Daurada. The Aparthotel Mercure Atenea Aventura has 94 spacious and recently renovated rooms, available in standard, privilege, apartments and rooms with terrace. It is ideal for family stays as it offers the possibility of accommodating up to 4 people, between the bedroom and living room. The hotel also has a buffet-style restaurant for breakfast and an ample and meticulous menu prepared with Mediterranean products. As additional services, the hotel has 5 meeting rooms equipped with all kinds of audiovisual material, free Wi-Fi service throughout the hotel, a spa area, where you can enjoy a wide variety of health and beauty treatments, an outdoor pool with solarium, a library, playground, cafeteria, business corner, parking, bike rental and shuttle service from the Aparthotel to Port Aventura and the beach, as well as different routes and points of interest. The Aparthotel Atenea Valles is an excellent choice for golf lovers. Family events, wedding banquets, gala dinner. 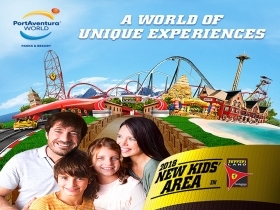 It’s only two minutes far from Port Aventura theme park and Ferrariland, also only 4 kilometres far from the beach. The Wellness & Spa Aparthotel Athena Adventure offers a wide range of services aimed at their welfare, health and beauty. Our facilities also feature a fitness center, which has state-of-the-art fitness and bodybuilding equipment, so you can keep up with your daily workout routine. Check out our massage services with paraffin mud applications, lymphatic drainage, beauty services and treatments that are fully customised to your tastes and needs. Four meeting rooms seating 15 to 300 people with natural lighting, acclimatisation, creative assembly à la carte, phone in the room, Business corner, audiovisual material: TV, VTR, overhead projectors, cameras, megaphones, computers, LCD spotlights and all the complements. Different proposals business menus and coffee breaks we have prepared. All of them designed to adapt to the needs of your meeting or events. With natural lighting and fast Wifi. Download our A la Carte Meeting Room. Download our business menus and coffee breaks. Breakfast buffet with a fantastic assortment of artisanal, fresh and local products to start your day as you read the daily press. Start the day with a great breakfast! The Restaurant Atenea Aventura presents a traditional cuisine that is both seasonal and creative, offering culinary products in its Seasonal Menu that rely on regional ingredients to make meticulous and elaborate dishes. Organise your family reunions, celebrations, gala dinners, banquets, weddings, cooking workshops and more in our Restaurant. Until 20% off for your early bookings! Book with 30 or more days in advance and get 20% discount! Enjoy the best offer: until 20% off with our non-refundable rate. For booking made 30 or more days in advance. Includes accommodation only, accommodation and buffet breakfast or half board (depending on the chosen option) and VAT. Enjoy your stay in Port Aventura!! Romance under the light of the candles. Includes stay in standard double room, buffet breakfast and a delicious romantic dinner for two persons (water and wine included). We also offer free access to our spa area, and welcome glass of cava. Late check out possibility (Subject to availability. Ask at the front desk). From 55€ per person in double room. VAT included. Includes stay in double room, buffet breakfast, welcome glass of cava, free access to the spa zone, essential massage . Late check out under availability (ask at the front desk).